One of contemporary music’s consummate vocalists, Al Jarreau is as stylistically diverse as he is distinguished. The only artist to win Grammy Awards in three separate genres — pop, R&B, and jazz — Jarreau has turned out a superlative body of work over the course of his career. And with his latest release, The Very Best Of: An Excellent Adventure (Rhino), he brings the breadth of his catalogue suitably—if not definitively—into focus. Evidenced most throughout this sixteen-track set is Jarreau’s versatility, as much in the myriad of song forms he’s embraced as in how he's tailored his voice to best suit them. Whether on serpentine grooves like “Roof Garden” and “Boogie Down” or on a more measured treatment such as “Spain (I Can Recall),” Jarreau envelops each phrase with nimble precision and nuance. Likewise, he enriches the sumptuous, pop-flavored rushes of “Mornin’” and “We’re In This Love Together” with earnest, palpable joy. And he renders such rhapsodic ballads as “After All” and “We Got By” with soaring, soulful command. Rounding out the set is the freshly recorded title track, its brisk and percussive arrangement comparable to some of the livelier featured cuts. However, as is the case with many new or unfamiliar songs that often get tacked onto best-of collections, this one just doesn’t resonate as well as the primary material. 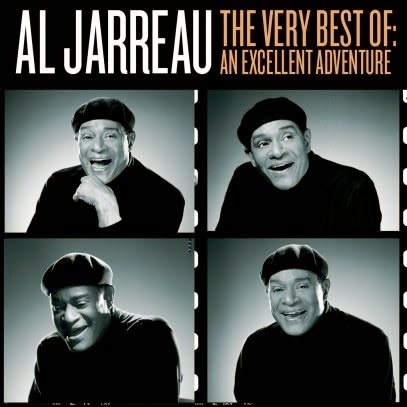 Because of the range that has underscored Al Jarreau's career to date, it would be difficult for a compilation (save for a box set, perhaps) to reflect his every artistic dimension and diversion. Indeed, a plethora of live cuts, duets, and still more of his own signature performances — “It’s Not Hard To Love You,” “Trouble In Paradise,” “Teach Me Tonight,” and “Heaven and Earth," to name but a few — could just as well have merited inclusion here. For a one-disc retrospective, though, The Very Best Of: An Excellent Adventure succeeds as an adequate sampling.